It made its debut at the recent Rotary Club annual Classic Car Show. The completely restored 1974 Jeep CJ5 goes on public display again at the Cancer Society’s Relay for Life at El Morro Elementary on Saturday, Oct. 15. And next week, former Laguna Beach lifeguards plan to donate their labor of love as a gift to the city. The restored lifeguard Jeep set to be donated to the city of Laguna Beach next week. Photo by Marilyn Young. In the summer of 2015, Laguna local Al Mendez, whose hobby is restoring BMWs, was pondering his next project over a beer with a few veteran Laguna lifeguard friends. Mendez guarded after his junior year at Laguna Beach High School in 1975 until his last summer at USC in 1981. The idea to restore a Jeep to look like the original units they drove in their guarding days came up. It took no time at all for the three friends to get on board with the plan. Using Craig’s list, Mendez found the right year and model in the not-to-distant San Bernardino County town of Highland. While he was combing the internet for parts, his friend, who helped conceive the project and shapes surf boards as a hobby, set about to make a copy of a board the guards used in rescues back in the day. Equipment such as the rescue cage, buoys and a red light for the top that Mendez says actually works, were found on-line. 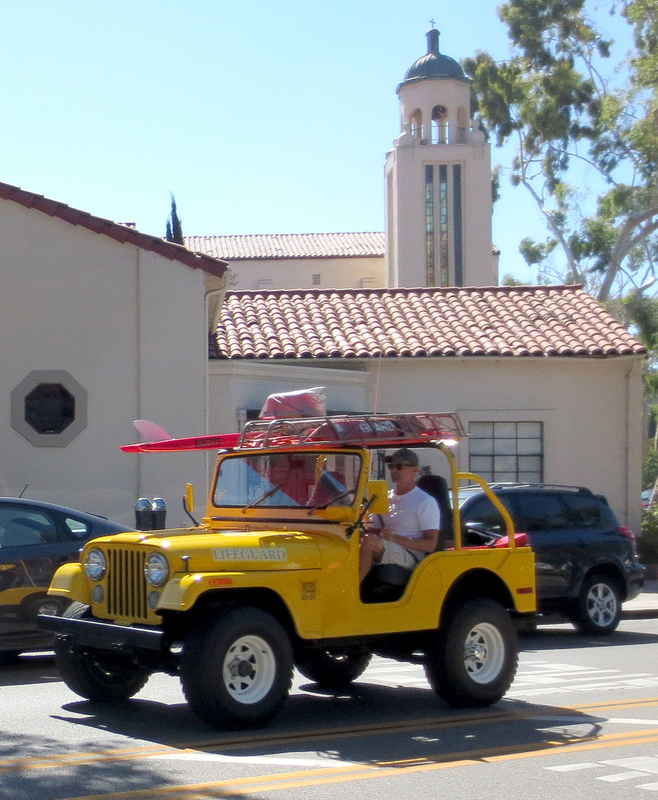 Before the restoration was totally finished, Mendez started taking the Jeep on short excursions around town. Photos of it taken by another local ex-guard, Mitch Ridder, showed up on Facebook and eventually Mendez showed off his handiwork to Marine Safety Chief Kevin Snow. The veteran guards became attached to the vehicle, known in the department as a 5511, and began to develop a plan to keep it in Laguna. Acknowledging that it would be hard to find a buyer for “such a unique project,” Mendez reached out to Dale Ghere, another old guarding buddy. Since a reunion of former lifeguards in 2004, Ghere, a Laguna Beach resident, has compiled a contact list that he now uses to send newsletters to 300 former lifeguards. Using his email list, Ghere laid out a plan to raise funds to pay for the restoration, which Mendez described as “pretty expensive,” to keep the unit in town. Within four months, $12, 500 was donated to the project, which Mendez says covered most of the cost of restoration. At the next City Council meeting, Tuesday, Oct. 18, a consent item includes acceptance of the vintage unit as a gift to the city, said City Clerk Lisette Chel-Walker. Like the fire department’s 1931 Seagrave antique fire engine that rolls out for the Patriot’s Day Parade, Exchange Club pancake fundraisers and Hospitality Night, the 5511 could join the line up at public safety events and community functions. Ghere is optimistic the city will accept the gift and is advocating for dedication of the vehicle to Chief Bruce Baird, who led the guards from 1973 to 1991 because, “he had such a positive influence on so many of us,” said Ghere. Baird died of cancer in 1995. Ghere thinks the restored Jeep is as enticing a recruiting tool as an old fire engine. “If this unit influences one kid to become a guard and that guard saves just one life, we’ll be pleased,” he said.